Rabbit anti Human Osteoprotegerin / TNFRSF11B. 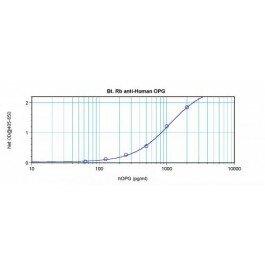 E.coli derived Recombinant Human OPG. Produced from sera of rabbits pre-immunized with highly pure (>98%) recombint hOPG (human Osteoprotegerin). Anti-Human OPG specific antibody was purified by affinity chromatography and then biotinylated.